The Orlando Pride welcome Sky Blue FC to town Saturday June 16, at 7:30 PM EST at Orlando City Stadium in Orlando, Florida. The Orlando Pride will host Sky Blue FC in the pair's first meeting of the season. Both teams are coming off of 0-0 draws last time out. Both teams come into this match with contrasting fortunes. Orlando comes into this game third in the table with a 4-3-4 record, just two points off of 2nd place Seattle, while Sky Blue continue to languish at the bottom of the table with a 0-8-2 record, seven points off of nest to last placed Washington. This game holds big implications for both teams, for Orlando it could help them further solidify a potential playoff spot, whereas for Sky Blue, it could help kickstart their season and maybe one of the more improbable comebacks in National Women's Soccer League history. With North Carolina seemingly running away with things in the regular season, many teams will be looking to finish as runners-up with second through seventh place currently separated by four points. Orlando currently sit third, just two points off of Seattle, but have so far played one game more than the Reign. The Pride are coming off a 0-0 draw with the Reign, and can look at that as a positive given the game was away and both teams were relatively evenly matched in both shots and possession. One player who has really helped Orlando to their current third place standing is forward Chioma Ubogagu, who is currently tied for third in league scoring with four goals. Ubogagu as well as a combination of two of Alex Morgan, Rachel Hill, and Sydney Leroux could really form a lethal attacking trio if things start to click among them. Another key to Orlando's success is of course Marta. She currently has two goals and three assists in six games this season. even though those numbers are already impressive, it is still possible to see them improve her scoring rate. This Orlando attack against a not so steady backline for Sky Blue FC could spell serious problems for the New Jersey team. 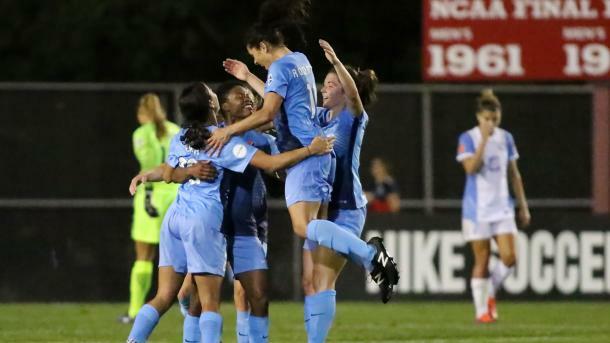 After showing promise last Friday against Washington, Sky Blue could still only muster a 0-0 draw. The performance however, was probably their best of the season. They had the advantage in shots, shots on goal, crosses, and had fewer fouls. They did however have fewer total passes, a lower passing percentage, and less possession. Shea Groom had a pretty frustrating game. While she had loads of chances, she just wasn't able to convert them. Whether it be passing when she should have shot, or just not getting the best of shots off, she just was not able to find the back of the net. This game was far from full strength however, with both teams having players out with injury or on international duty. With internationals now back with their NWSL teams, this game should give us a good indication as to exactly where both of these teams stand as we approach the midway point of this season. This will be a tough game for Sky Blue. They'll need to employ a bend don't break tactic in order to be able to cope with Orlando's impressive attack. Sky Blue are still last in goals scored with six while Orlando is tied for second with 16. 16 also happens to be the amount of goals Sky Blue have conceded this season. If Orlando is able to break through this well-organized, but not overly talented Sky Blue defense, it could be very hard for Sky blue to be able to get anything from this game. The Orlando Pride will host Sky Blue FC Saturday night, June 16, at 7:30 PM EST. The match will be streamed on the go90 app and go90.com.